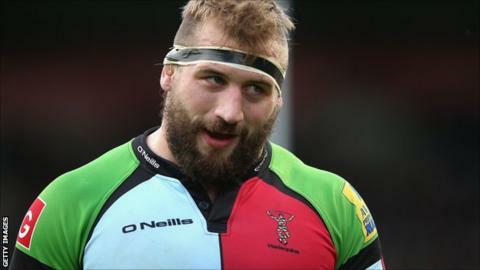 New Harlequins captain Joe Marler has admitted he is daunted at leading the side this season, conceding he will be entering uncharted territory. However, prop Marler, who takes over the responsibility from England's Chris Robshaw, says he feels privileged to have been made skipper. "I'm nervous, very apprehensive about it," Marler, 24, told BBC Sport. "It might not sink in until it is gone. The more I think about it the more honoured and proud I am." Marler, who came through the club's academy, says he is unsure what type of captain he will be, adding the last time he led a team was at Under-18 level. Despite his relevant inexperience though, the England forward, who has 22 caps, says he first and foremost wants to earn his place in the team but will not be fazed by the responsibility. "Sarries is the game I look forward to the most, because there is a good rivalry and I don't particularly like them." "I suppose the thing I am most nervous about is making sure I deserve my place," he added. "That's the biggest thing. "I'll say what is needed to be said and I won't say stuff for the sake of it." Robshaw has been relieved of the responsibility in order to concentrate on his international commitments ahead of next year's 'home' World Cup. Marler admitted it was especially daunting to replace the England captain and still intends to call on his experience and knowledge. "He's led the club to three trophies in the past four or five years and it's been our most successful period, so they are big boots to fill," said Marler. "With him being the senior guy with England it's a bit daunting, but he is a great guy and character and someone that is always willing to help." Marler says he will especially enjoy leading Quins out this season against Saracens, who beat them in last term's Premiership semi-final. He explained: "Sarries is the game I look forward to the most, because there is a good rivalry and I don't particularly like them." In comparison to the 25 new players at Premiership newcomers London Welsh, Quins have added two key names to their squad with the arrival of England wing Marland Yarde from London Irish, and Waikato Chiefs wing/centre Asaeli Tikoirotuma. And director of rugby Conor O'Shea is determined to improve on last year's trophy-less season and says there is a determination from everybody at the club to do so. "We want to be the best Quins team we can be, because if we are we will be right up there," O'Shea told BBC Sport. "Everyone wants to win it and our players are very proud. They have huge expectation, they were disappointed at the end of last season that we didn't win any silverware for the first time in a few years, which was tough. "We want to win things but we will only do that by being the best we can be."